Phew - those 19 hours have flown by! That's all from our live coverage of the council elections, for the latest on the political landscape in Wales, see here. If you've enjoyed our live coverage, you don't have to wait long for more of it, we'll be back to do it all again for the general election on 8 June. Labour has suffered losses in Wales during the council elections but the Tories have failed to make as many gains as expected. Labour was hit with three major blows after losing control of Blaenau Gwent and Bridgend, as well as its council leader in Merthyr Tydfil. But it held seven councils including Cardiff, Swansea and Newport. Many of the losses were to independent candidates. In Monmouthshire, however, the Conservatives won control outright. Last but not least, Conwy gives us the full set and is the final council to declare its results. In England, the Conservatives have made big gains, taking control of 10 councils, while Labour and UKIP suffered losses. The picture is similar in Scotland where Tories gained seats, while Labour lost control of Glasgow council for the first time in 40 years. Plaid Cymru's Rhun ap Iorwerth says the party's local election performance was solid. 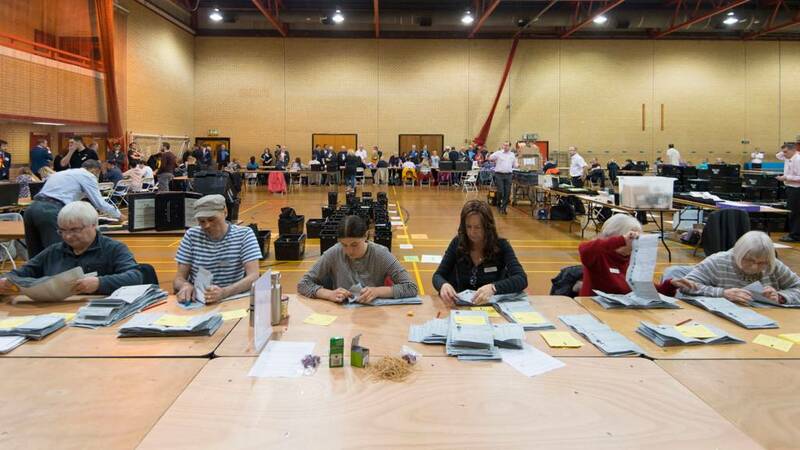 A university lecturer has used his artwork to capture the atmosphere of a local election count. Illustrator Dan Peterson drew the scenes at the count for seats in the Cardiff north area at Llanishen Leisure Centre on Thursday night. The Cardiff Metropolitan lecturer created the sketches to explain what happens during local elections. "People need to be more aware of what happens, in some cases voter turn-out was only 30-odd percent," he said. Labour's results in Swansea and Cardiff are better than expected. So who deserves the credit? Stephen Kinnock, a critic of Jeremy Corbyn, hails the leadership of Welsh Labour's "fantastic first minister" Carwyn Jones. Meanwhile, Mr Corbyn's loyal shadow chancellor John McDonnell, links success in Cardiff to Mr Corbyn's recent visit there. Mr McDonnell neglects to mention that Labour lost all four seats in Whitchurch - the ward Mr Corbyn visited - to the Conservatives. It's a mixed picture, says Labour. Trouble is, an opposition party hoping to form the next UK government should hope for a lot, lot better than that. With 53 of the 73 seats declared, Labour crosses the line of 37 needed to have an overall majority. The party has 39 with Plaid Cymru on 12 and two for independents. Video caption: Sam Kurtz is one of the new Conservatives councillors in Pembrokeshire.Sam Kurtz is one of the new Conservatives councillors in Pembrokeshire. Labour members celebrate as they retain control of Rhondda Cynon Taf council. Would you believe it - we've got a THIRD drawing of lots! This time it's in Caerphilly - specifically the Newbridge ward. Leeroy Jeremiah is the lucky man in the 50/50 draw with Kath Baker left cursing her luck. Sam Kurtz is one of the new Conservative councillors in Pembrokeshire, after gains. Councillor Carl Cuss was elected unopposed in the Twyn Carno ward in Caerphilly - the only uncontested seat in the county borough. "I see it as a vote of confidence in the work that I've done, obviously I would have loved a challenge to prove to the people what I've done in the ward and give them the democratic right to elect a councillor."